If your cat's heart has a different sound when heard through a stethoscope, your veterinarian may diagnose her with a feline heart murmur. Some heart murmurs have no symptoms and no effect on the functioning of your cat's heart, while others can be very serious medical problems. 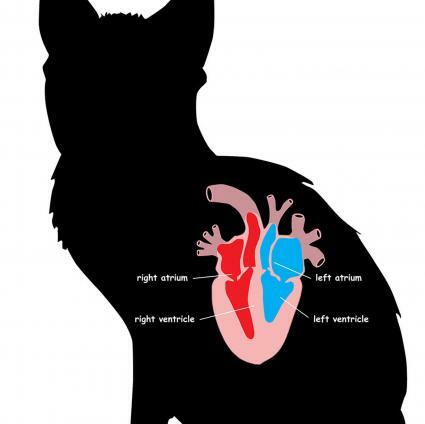 What Is a Cat Heart Murmur? A heart murmur in cats is an abnormal sound that can be heard through a stethoscope. Heart murmurs are caused by turbulent blood flow. Instead of producing a typical lub-dub sound, the normal heart noises will sound sloshy or will have a whooshing sound to them. Heart murmurs in cats are graded on a scale from I to V (or VI) and typed. A grade I heart murmur can barely be heard by your vet. The grade VI murmur is the easiest to detect and often completely obscures all normal heart sounds. With severe heart murmurs, you can feel the murmur through the chest, although this is more commonly experienced in dogs than in cats. This is called a thrill. A heart murmur can also be associated with different portions of the cardiac cycle. According to VCA Animal Hospitals, most murmurs are systolic, occurring during the time that the heart is contracting. Other murmurs can be diastolic, which means that they occur when the heart is relaxed, or filling with blood. What Is Causing the Murmur? Depending on your cat's age, the grade of the murmur or other symptoms present, your cat's veterinarian may as for additional testing. 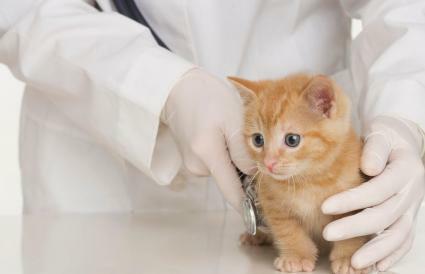 Many kittens will have an innocent heart murmur when they are seen for one of their first check-ups. Your veterinarian will listen for the murmur at another visit. If it persists, or if the grade increases, then further testing for congenital heart diseases may be needed. If the murmur goes away as your kitten grows, then no other testing will be needed. For an adult cat, it can be tough to determine whether a heart murmur indicates a medical problem that needs treatment. If your cat has other signs of illness, such as weight loss, poor appetite, vomiting, or increased thirst, your veterinarian may recommend tests like a blood profile or a series of x-rays. This can help to determine if your cat has any non-cardiac problems that could cause a functional murmur. If your cat has any heavy breathing, this could indicate a build-up of fluid in the chest from congestive heart failure. If your cat has a heart murmur accompanied by breathing problems, this makes it more likely that the murmur is pathologic. Many middle-aged or geriatric cats will develop a form of heart disease called cardiomyopathy. An x-ray can be helpful, but it only evaluates the overall size of the heart. The best way to evaluate the heart for structural changes like cardiomyopathy is with an ultrasound. When an ultrasound of the heart is done, this is called an echocardiogram. This is a specialized test and your veterinarian may refer your cat to a cardiologist if this is necessary. Most heart murmurs are identified during routine checkups. For many heart murmurs, no treatment is ultimately needed, but it is important to perform tests that will help to guide this decision. If your cat has a functional murmur, then the specific treatment will depend on what underlying condition is causing the murmur. For some medical problems, such as anemia, hyperthyroidism, or high blood pressure, medications may be indicated. In some cases, such as in cats with hyperthyroidism, the murmur can have both a functional and a pathologic component. For cats with cardiomyopathy, there is controversy among veterinary cardiologists about which medications are indicated at which point in the disease process. If your cat develops congestive heart failure, then medications will definitely be needed. These could include a diuretic such as furosemide (Lasix), or medicine like enalapril or benazepril. Cats with severe respiratory difficulty may need to be hospitalized for oxygen or could require other procedures. Cats with mild cardiomyopathy may not need any treatment until the disease progresses. Other cats may need beta-blocker medications, supplements like taurine, or medicines that prevent blood clots. The different types of cardiomyopathy can only be distinguished on an echocardiogram, and the exact treatment needed will vary for each individual cat. Many cats with a heart murmur suffer no ill effects and live a normal lifespan. Even cats with a more severe murmur accompanied by Hypertrophic cardiomyopathy can live for many years if they respond well to medical treatment. However, if a cat with a heart murmur develops congestive heart failure, their life expectancy will be about 6 to 18 months. If your cat is diagnosed with a heart murmur, it is important to figure out which type of murmur is present. Follow your veterinarian's instructions for follow-up and testing carefully. 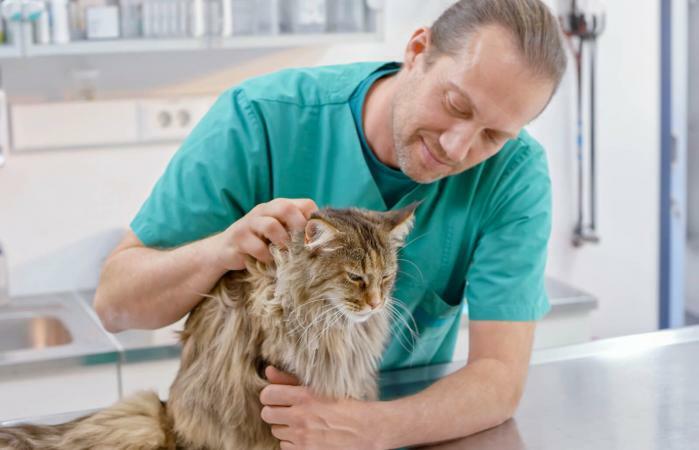 If your cat is diagnosed with cardiomyopathy, keep up with your pet's medications and appointments so that she will have the best quality of life possible.